This case note concerns an application for the issuing of passports for children and the subsequent proposal for international travel for the children. The Mother sought the issuing of Australian passports for her two children, X, born in 2013 and Y, born in 2015, and for orders for international travel for the children. The Mother, an Australian citizen, and the Father, a citizen of Country B in Africa, met and formed a relationship in Indonesia, subsequently moving to Country C in Asia and marrying. The children are children of that relationship. The Mother and children live in Country C, which is the place of the Mother’s employment with a multinational company. The Father is currently in Country C.
The relationship ended between the parties in October 2017. There were subsequently court proceedings conducted in Country C. Those proceedings in Country C resulted in orders allocating all parental responsibility to the Mother and requiring the Father to pay child maintenance. There was no provision for the children to spend time with him. The mother advised her intention was to retain her employment in Country C and for the children also to remain there. The children are Australian citizens and hold Australian passports. Those passports are due to expire for Y, at the end of 2019 and for X, 19 December 2018. Unless the children hold an Australian passport they are unable to obtain a visa to enable them to remain in Country C.
The Mother had applied to the Australian Passports Authority for a renewal of the passports, however, that application has been refused. She requires an order of the Court to obtain the passports as she does not have the consent of the Father. The father opposed the issuing of the passports for the children. He also noted that he missed the children and had not seen them and that this was the only hope that he would be able to see them again. He made no application other than responding that the passport related application should be refused. The Mother was cross-examined briefly by the Father, indicating that the children are both very well and very happy. The Father was cross-examined by the Mother’s solicitor. He was not able to give a residential address, but indicated that he was still present in Country C. He accepted that the children live in Country C, can only live there with their Country C visas, that they can only have their Country C visas if they hold an Australian passport, that otherwise they will be required to leave Country C, move to Australia where they would change schools, leave their friends and leave their extended support including their nanny. The Mother’s position was that if the passports are not renewed then she will need to leave Country C with children forthwith, quitting her job with a multinational company. She says that she cannot transfer the job with that organisation to Australia. She says that the children have never lived in Australia, and she has not lived in Australia for many years. If she returns to Australia she will face uncertain employment and will be without the support that she currently enjoys in Country C. The children will leave their schools, their home and their friends to live in a foreign country that they have not lived in before. The Mother is uncertain how she will financially support the children in those circumstances. The Mother asserted that the above circumstances would be traumatic to the children and contrary to their best interests. Although there were no orders for the children to spend time with the Father, the mother said that she would like children to have a relationship with him. At present his whereabouts are uncertain, he identifying his place of residence is Country B. However, he is has also identified that he is currently in Country C, in City D. The Mother notes there is no evidence that, if the children were to come to Australia, that the Father would be able to obtain an Australian visa. Under those circumstances she notes that if the children were to have time with the Father then that would need to take place in Country C where they all currently are. (iii) the child to live or spend time with another person who is outside Australia. (d) in the case of a child who is outside Australia—the child departed Australia less than 12 months before the application for the Australian travel document was made and the Minister considers that an Australian travel document should be issued to enable the child‘s return to Australia. (3) If the Minister refuses to issue an Australian travel document to a child, the Minister may declare that he or she is refusing to exercise the discretion under subsection (2) because the matter should be dealt with by a court. (d) the person has guardianship or custody of, or has parental responsibility for, the child under a law of the Commonwealth, a State or a Territory. It was noted by Watts J in Withers v Russell & Anor  that an order granting sole parental responsibility under Australian law does not resolve the issue sufficiently to result in the issuing of a passport. This is because an order for sole parental responsibility does not strip the other parent of all aspects of parental responsibility. Sole parental responsibility removes from one parent the ability to make the major long-term decisions for a child. When a child is in that parent’s care that parent still retains aspects of parental responsibility related to the day to day care of the child. The application made by the Mother is cast so as to catch the enabling provisions at s 11(1)(b)(i)and (ii) of the Australian Passports Act 2005, such as to allow the issuing of a passport despite the lack of consent by the Father. That is, she seeks orders directed both to the obtaining of the passport and the allowing of international travel. An issue arises as to the nature of the orders that are sought and the power by which such orders would be made. The authority to make such orders was identified by Justice Watts in Withers v Russell & Anorat  and following. He noted that the power arises either as a parenting order directed to “any aspect of the care, welfare or development of the child…” per s 64B of the Family Law Act 1975, or alternately as an order relating to the welfare of the children (as part of the parens patriaejurisdiction) pursuant to s 67ZC of the Family Law Act 1975. Under either head of power the best interests of the children is the paramount consideration. Those best interests are to be determined on a consideration of the matters set out at s 60CCof the Family Law Act 1975. Different considerations and reasoning processes arise dependent upon which source of power is used to make such orders. If the order is made as a parenting order then s 61DAof the Family Law Act 1975 (which relates to a presumption of equal shared parental responsibility when making parenting orders), comes into play. It is difficult to envisage how a resolution of parental responsibility sufficient to deal with international travel would not also involve a determination of parental responsibility more broadly, or at least a consideration of that parental responsibility more broadly, particularly as it would be necessary to at first deal with the starting point created by the presumption. This in turn calls into question the broader arrangements for the care, welfare and development of the children. There are significant difficulties in dealing with such in this case, I will return to this aspect later. The welfare power as contained at s 67ZCof the Family Law Act 1975 does not contain the same constraints as to presumption and reasoning process. The Court’s ability to determine best interests in the context of s 67ZC is bounded by s 60CC as understood in the light of the objects of Part VII, but not hindered by a particular presumption or reasoning framework. The general circumstances identified by the Mother and accepted by the Father speak strongly to the proposition that orders allowing the children to remain in Country C are in the children’s best interests. The Mother is the primary carer, they live with her pursuant to orders made by the Country C Family Court (s 60CC(3)(b) and (m)). Absent orders there is no evidence to suggest that the children have a prospect of maintaining any sort of relationship with their Father (s 60CC(2)(a)). The failure to issue the orders would result in a significant change of the children’s circumstances, likely in turn to have significant impact upon the children; that is impact upon their support, upon their relationships, and the removal of all that is familiar to them (s 60CC(3)(d)).While there are other matters raised in the parties’ material, including competing allegations of family violence the proceedings are not apt to be able to resolve those issues. The above matters, the factual basis for which seems to be incontrovertible, bear out that it is in the children’s best interests to have orders made to allow them to remain in Country C.
In turning to the question of the head of power most apt for the making of the orders, consideration should be given to the scope of the proceedings that would be necessitated dependent upon which head of power is relied upon and also whether such scope of proceeding should be heard in Australia at all. Once the jurisdiction conferred by section 60 through the family law act 1975 Commonwealth the act on the family Court in custody proceedings is effectively invoked… the Act requires that the Court regard the welfare of the child as the paramount consideration in exercising the Court’s power. Their Honours then grappled with the issue of orders for speedy return of children who have been abducted to Australia, to their country of origin. It may be observed that the facts here are somewhat different given that the children are in Country C, which is their home, and the courts of Country C have already made orders resolving what should happen in relation to the children. 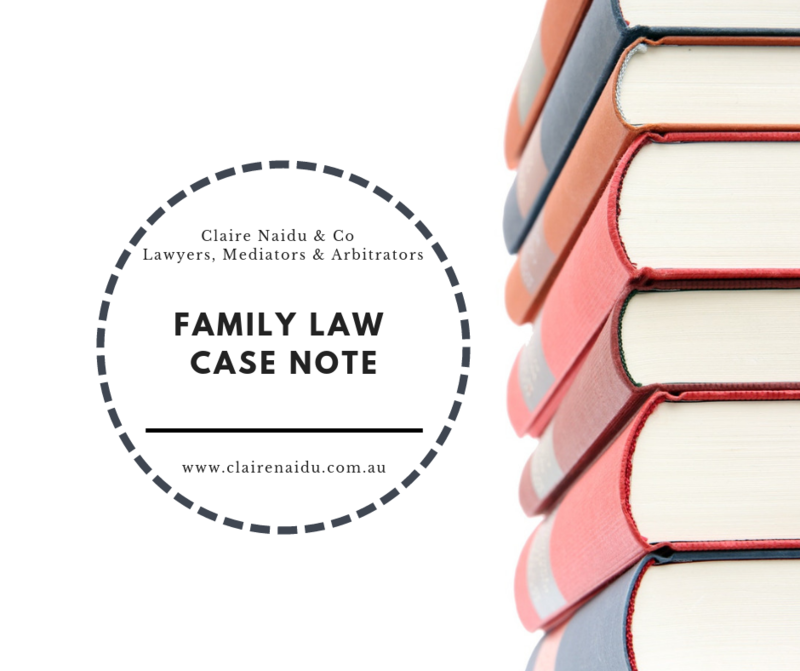 The court there noted that the particular circumstances of the case may mean that it is in a child’s best interests for a speedy return order to be made, summarily determined by the Family Court of Australia. Such an order is not a case of the Family Court declining to exercise its jurisdiction, but rather “it is exercising its jurisdiction by making an order dictated by the welfare of that child”. A summary hearing may be necessary because the Court must balance the need for a speedy determination against the desirability of an adequate inquiry into welfare generally. It may be possible to restrict the inquiry to matters bearing directly on the effect which the child’s presence in Australia and his or her absence from the other country has on the child’s welfare. But the Court must not make its determination by presuming that any child’s welfare is better served by leaving the child in Australia or, conversely, by ordering the return of the child to his or her previous or usual country of residence. Nor can the Family Court abdicate its own duty to determine the proceedings in accordance with s.64(1)(a) by deferring to the judgment of the court of another country unless the particular circumstances of the case show that that course is in itself in the best interests of the child. … although as a general proposition the courts of the place of the ordinary residence of the child might be expected to be best suited to determine what is for the child’s welfare, that expectation can be displaced by the circumstances. The welfare of a particular child is a unique and often difficult problem; the solution is not to be pre-empted by a general presumption about the capacity, sensitivity or procedures of the respective courts which might have had, might have or might acquire jurisdiction over the child’s custody. The consequence of the circumstances of this case is that it is firstly in the children’s interest to determine the passport issue in a summary fashion. This is because a failure to do so would be contrary to their best interests as it would necessarily result in the uprooting of the children from their home in Country C, being returned to Australia, a home they have never known, under circumstances where the Mother’s ability to support them will be thrown into uncertainty. Such orders will then leave the children in Country C, under the care of their Mother, in accordance with orders made by the Country C Family Court. It is not in the children’s interest that a broader enquiry as to parental responsibility and what may flow from that be conducted in Australia in the face of the urgent need to deal with their ability to remain in Country C. On the securing of their ability to remain in Country C, under the circumstances where that is their home, is where their Mother lives and works, where their Father currently is, and further, where the parties have already engaged in litigation to resolve issues concerning the children, it is not in the children’s interests that further issues of parental responsibility then be resolved in Australia. The circumstances are analogous to those spoken of in ZP & PSthat would occasion a summary return. The key difference here is that the children are currently physically in Country C and the issue is whether their presence in Country C can be secured, as opposed to the case where children are in Australia and their return to another country is being considered. In this case, no relevant distinction flows from this difference and the principles set out in ZP & PS appear to be applicable and the consideration of the circumstances leads to the conclusion that it is in the children’s interest to dispose of the matter summarily, without a broader consideration taking place. That in turn points to using, as the source of power, s 67ZCrather than s 64B, as s 64B would necessarily case the scope of the proceedings more broadly then available in the current summary context. Orders were made to authorise the issue of passports and international travel and the Australian proceedings were then terminated. (1) X (born … 2013), and Y (born … 2015) (“the children”) are permitted to have Australian passports. (2) The mother, Ms Mosman, is permitted to obtain and renew the children’s passports in accordance with, and facilitation of the above order, without the consent of the children’s father, Mr Taylor-Mosman. (3) X (born … 2013), and Y (born … 2015) (“the children”) are permitted to travel internationally with the mother. This article does not represent the views of the firm. It a case note based on a decision made in the Family Court of Australia. If you are seeking advice in relation to a family law court or family law matters such as divorce or property settlements or passport matters, contact Claire Naidu & Co, Lawyers and Mediators for family law advice. Click here for our contact details.